Fats Domino, one of the most influential rock and roll performers of the 1950s and 60s, has died aged 89. An official from New Orleans coroner's office confirmed the death, which was earlier announced by Domino's daughter to a local television station. Fats Domino - whose real name was Antoine Domino Jr - was one of the first rhythm and blues artists to gain popularity with a white audience and his music was most prolific in the 1950s. Domino had 11 US top 10 hits and his music is credited as a key influence on artists during the 1960s and 70s. Elvis Presley referred to Fats Domino as "the real king of rock n roll" and Paul McCartney reportedly wrote the Beatles song Lady Madonna in emulation of his style. In 1986 he was among the first inductees into the Rock and Roll Hall of Fame, but by his later life Domino would no longer leave his Louisiana hometown - not even to accept the award. New Orleans-born musician and actor Harry Connick Jr is among those who have paid tribute to Domino on Twitter, saying he had "helped pave the way for New Orleans piano players". 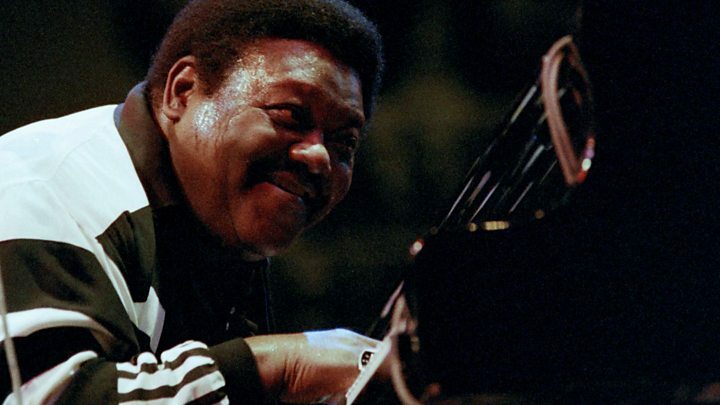 Antoine "Fats" Domino Jr was born in New Orleans on 26 Feb 1928, the son of a violinist. His parents were of Creole origin, and French Creole was spoken in the family. He was given his nickname by bandleader Bill Diamond for whom he was playing piano in honky-tonks as a teenager. He said the youngster's technique reminded him of two other great piano players, Fats Waller and Fats Pichon. In the mid-1940s, he joined trumpeter Dave Bartholomew's band, and the two co-wrote Domino's first hit The Fat Man. Suddenly, the New Orleans sound became popular nationwide. Image caption "Clean living keeps me in shape. Righteous thoughts are my secret...And New Orleans home cooking"
In an interview with the BBC in 1973, Domino spoke about his early life. He said: "I was 17 when I made my first record in 1949. I never thought about being professional. I used to work in a lumberyard and that's where I first heard a number on a jukebox and I liked it. It was a piano number. It was called 'Swanee River Boogie' by Albert Ammonds." Despite both musical heavyweights coming from New Orleans, Fats Domino said he only met Louis Armstrong twice in his life. He told the BBC in a later interview: "I liked the way he was singing 'Blueberry Hill'. See, a lot of people think I wrote 'Blueberry Hill' but I didn't. "That number was wrote in 1927 and I recorded that song in 1957. We just put a different background and I just sing it the way it would fit me and it came out great for me."